I left Intel Corp in 2015 at the peak of my career, without a plan. My timing surprised me as much as it surprised my colleagues. I had entered the fourth decade of contributing to the semiconductor industry and to Intel Corporation, most recently building Intel Custom Foundry from scratch. It was a thrilling experience, completed alongside colleagues I continue to respect, count as friends, and miss. I didn’t want my next step to be a planned transition to a new career; all I wanted from it was to be the first step in exploring life beyond my first career. It was a luxury I wanted to experience. Leaving colleagues was not easy. I was walking away with good wishes from a large network of colleagues within Intel and across the semiconductor industry, my lifeline as I dive into my future. Many of them wrote notes I will cherish for the rest of my life. My memories are already beautiful. I call them roses to smell forever. I can’t wait for them to get even better over time. I am now four months into my exploration. Some days I feel nothing but the winds of liberation in my sails as I seek new connections and new learning. Most days are a healthy mix of the joy of exploration, fulfillment in small achievements, sadness of not working alongside my colleagues who are busy taking Intel Custom Foundry forward, and fear that in the long run my exploration may turn out to be a giant blah. I am helped by reading. Authors David Corbett and Richard Higgins, in their book Portfolio Life, have inspired me to view the road I am on as an opportunity for 20 – 30 years of vibrant contribution, thanks to longer and healthier modern day life spans. Their concept of a life portfolio has prompted me to adjust my activities to more closely fit my values. I have increased family activities, reading, writing, networking, giving, and shaping my passion in organizational and leadership development into business offerings. I am inspired by ordinary people doing extraordinary things with their lives, like those I met at the Small Business Development Center, a part of the Small Business Administration (SBA). With their life passions, expertise, aspirations and limited resources, these people are acting out the concept of solo entrepreneurship. Jackie Peterson’s class helped give shape to my own vision for a small management development business, which I have named Reach for Infinity and will cultivate over time. 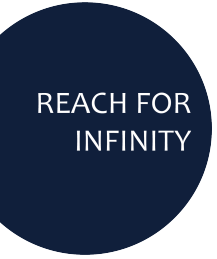 Reach for Infinity captures the ideas of stretching to reach for that which is beyond our existing capabilities and limitless growth through life-long learning. I look forward to writing, speaking, conducting workshops, and mentoring on organizational and leadership development. I launch the Reach for Infinity initiative with an Oregon IEEE Talk on contextual leadership in August. I have joined the bold vision of Dr. Charles Keller, Scientific Director of the Children’s Cancer Therapy Development Institute (cc-TDI) to make childhood cancers universally survivable, regardless of the diagnosis. In our discussions, it became obvious that application of engineering approaches and computing technologies can serve as accelerators for this vision. So I joined the board of cc-TDI to help drive this acceleration. Two board meetings later, I find myself excited and energized by what is possible. We have given shape to a strategy we call Engineering Forward. Under this umbrella, we are exploring a link-up with the Collaborative Cancer Cloud initiative. We have also kicked-off an initiative to harness the expertise and giving spirit of engineers in the Portland Oregon area in collaborative therapy development. In this regard, we have scheduled two talks sponsored by IEEE, Portland State University and cc-TDI. The mission is bold, the possibilities are exciting, and the reach is limitless. The path unfolds before me and I reach purposefully for the growth it promises.